This custom designed Large RusticAccent Screen Garden Stake (23" W x 47" H) will become a favorite indoor or outdoor decoration. A charming way to add some elegance to your home or garden decor. This custom designed Rustic Accent Screen garden stake will become a favorite indoor or outdoor decoration. 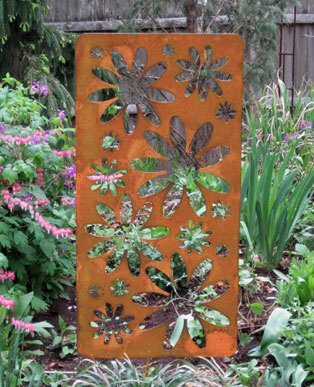 With it's beautiful flower pattern cut outs, the colors of your garden will peek-a-boo through. A charming way to add some elegance to your home or garden decor. Makes a great gift as well! Natural Steel (clear coated) - A clear finish is applied to the surface and will nayurally rust as the finish wears off over time. NOTE: We have many other size and color options available, We can make this hand crafted metal art small, larger, or different colored. If you do not see the size or color you are looking for, please contact customer service at tjb@TJB-INC.com for your own custom options. Since we make all of our hand crafted metal art to order, changes in size & color are no problem for us and we will be happy to accomidate your requests. Changes requiring a larger piece of metal will have a nominal price increase to cover material costs. Please allow a few extra days for us to create your piece. We are committed to ship your items as fast as possible! Most of our products are stocked in our warehouse ready to be shipped or are custom made to order. Orders normally go out within 1 to 5 business days of receipt. Business days include Monday thru Friday and exclude holidays. Please allow 6 to 14 business days for UPS Ground deliveries. When orders are shipped out, you will automatically receive a confirmation email with a tracking number. If an item is on backorder, we will contact you to let you know. Will my items arrive in time for the Holidays? It depends on when you placed your order. Most orders ship from our Connecticut warehouse. *Please Note: Most orders usually ship out within 24/48 hours. We ship all of our items via ground delivery so if you're trying to get something for a birthday or holiday, order your items early! You can always call and leave us a message in the comment section of your order with any specific dates or instructions that we should know about. In case we need to contact you, please leave us a good working daytime phone number. Orders placed up through Monday 12/20/10 by 5pm EST can still arrive in time by Christmas, but will most likely require upgraded Air shipping, unless you live in southern New England or surrounding areas. If you would like to send an order that must arrive by a certain holiday, simply write, "Needs to arrive by holiday!" in the Comment Section during checkout. If you like, you can also add, "Approved up to $____." If the actual shipping amount exceeds this pre-authorized amount, one of our customer reps will try and contact you with an exact shipping quote once your items are packed and ready to ship. At that time, you can either agree to ship it, decide to ship it ground, or cancel your order with no penalty. Most importantly, leave us a good phone number so we can reach you just in case! Krista & Chris want you to be completely satisfied with your purchase of their handiwork. If for any reason you are not, please contact us after you receive your order. We will issue you a RA#. You can return most products for a 100% refund of the purchase price within 30 days of purchase. To receive a full refund item returns must be in new, re-sellable condition, and within 30 days of the purchase date. Please contact us before you send any items back for additional instructions. Custom & Special Item orders are not returnable. In most cases, customers will be responsible for all shipping charges. If the product was purchased with "Free Shipping" and is returned, the customer will be responsible for "actual" freight charges both ways. Only the product cost and sales tax (if applied) will be refunded. We do not refund duties or customs fees. For your protection we suggest you send your return packages via UPS or FedEx to be sure the item is not damaged or lost in transit. With all returns please provide an RA #, shipping address, and contact numbers. 8/9/2013 – Another question, can I get this piece with a shorter stake attached? 8/9/2013 – What colors are available? Anyway to see the colors first?